Book Blogger Appreciation Week begins today! This is my second year participating in this event specifically for book bloggers. I started my blog a little over two years ago and have since visited many amazing and fun book blogs. Along the way, I've discovered a ton of great books for both myself and my kids. I keep a journal of recommended reads by other bloggers right by my computer, and I use the list to help us select books every time we visit our library. Hooray for book blogs! This week-long event includes daily prompts. The theme of this year's event is: A Treasure Chest of Infinite Books and Infinite Blogs. The first "treasure" prompt is all about new, recently discovered book blogs. 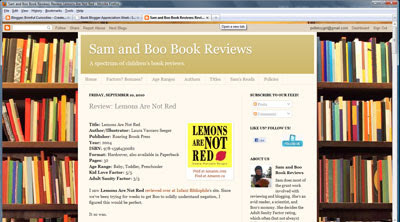 Today, I'm excited to share with you my newest book blog discovery: Sam and Boo Book Reviews. I happened upon this kidlit blog by way of Chronicle of an Infant Bibliophile within the last month and have been loving the high quality book reviews found there. Sam (the mom) and Boo (a two-year-old boy) offer their opinions on the children's books they read. The reviews also offer helpful insights for children diagnosed along the autism spectrum. They rate the books according to the Adult Sanity Factor (hee hee) and Kid Love Factor. This new blog is in its infancy (started in August 2010) but it has so much to offer to parents of young children. Take a peek for yourself sometime! An Adult Sanity Factor is such a cute and, I would imagine, helpful idea! Thanks for the recommendation! Thanks for introducing me to a new blog. Aw! Thank you so much! I'm thrilled you like the blog thus far. Sounds like a wonderful blog! I'll be sure to check it out! Adorable! Thanks for letting me know about these new to me blogs. As a preschool teacher I'm grateful there are so many passionate children's book bloggers out there.